Dimethicone, Isodecyl Neopentanoate, Water, Isododecane, PEG/PPG 19/19 Dimethicone, Trisiloxane, Trimethylsioxysilicate, C 13 16 Isoparaffin, Adipic Acid/Neopentyl Glycol Crosspolymer, Boron Nitride, Dimethicone/Bis Isobutyl PPG-20 Crosspolymer, C10-13 Isoparaffin, Glycerin, Salicylic Acid, Tocopherol, Lactobacillus/Eriodictyon Californicum Ferment Extract, Cymbidium Grandiflorum Flower Extract, Lilium Candidum Bulb Extract, Malva Sylvestris (Mallow) Extract, Sodium Hyaluronate, Serica (Silk), Alumina, Polyisobutene, Disteardimonium Hectorite, Dimethicone/Silsesquioxane Copolymer, Cyclodextrin, Ethylhexyl Palmitate, Silica, Methicone, Sodium Chloride, Sorbitan Sesquioleate, Propylene Carbonate, Triethoxycaprylylsilane, Silica Silylate, Silica Dimethyl Silylate, Tetrasodium EDTA, Phenoxyethanol, Caprylyl Glycol, 1, 2 Hexanediol. May Contain: Mica, Titanium Dioxide, Iron Oxide, Zinc Oxide. For the longest time i was singing the praises of this foundation. The coverage is amazing and it just feels great on your skin. I used it consistently, for almost two years. I'm pretty much addicted to foundation, cant leave the house without wearing it due to the state of my skin. Recently i decided i wanted to try something new and went out and bought a different foundation. After a few weeks I noticed my acne was a lot less inflamed and spread out across my face and i thought the change in foundation might have something to do with it. On a day that i knew i wanted a lot more coverage i decided to take a chance and use this again and it was definitely a mistake because i had a pretty decent breakout. Again i stopped using it and my face has calmed down. I definitely believe this foundation has been exacerbating my acne. I can't say i recommend it since i've now figured out it doesn't work with my skin, but i looked over dan's list of bad ingredients in the makeup post (i did this quickly, don't take my word for it) and couldn't find anything. I've been using this foundation on a daily basis for a while now and it seems to do an alright job. Here're some of the pros and cons I find this foundation has: Pros: - long wearing - controls oil well - good coverage, can double as a spot concealer - good shade range for light-medium complexions Cons: - even though this foundation is pretty cheap I tent to go through it much quicker than most other foundations I've tried - the packaging is pretty clunky - if you have dark skin you may not be able to find your shade in this Also compared to the regular Colorstay I much prefer this version, the coverage is slightly better but the main thing is this looks much more natural on than the original version, the original version may control oil/transfer a little bit less though bit I find this one holds up well for me. Also this isn't exactly the most natural looking foundation I've tried, it does look like it sits on top of your skin bit... not as badly as the original version though. I'm going to try opting for a BB cream instead when my skin clears up more. 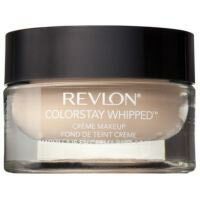 I first got this foundation wanting a full coverage finish, which I got, but I hated the heavy duty feeling. After a while, I started playing around with it and found it was a perfect concealer. I mean my skin literally looked flawless! I use it everyday under my bb cream. Before, I used to cover my whole entire face with a thick layer of foundation. I never did use concealers because they tended to break me out but now it's different. My primer, the whipped, bb cream, and a setting powder, all under 5 minutes. My skin looks so fresh, healthy, and natural . Plus, my skin has actually gotten better. Its perfect for an everyday look and my hunt for the perfect face makeup routine has stopped. Although it's not the best at being a foundation, it does wonders as a concealer.